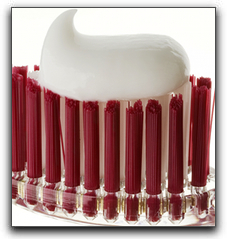 One of the most important aspects of good dental health is daily brushing with an effective toothpaste. In this post from Blaisdell Family Dentistry in Boise, we’ll discuss toothpaste – and maybe tell you more about it than you ever thought you would know. Toothpaste as we know it has only been in existence since the late 1800s. The earliest evidence of toothpaste or dental cream dates back to 3000-5000 BC. The Ancient Egyptians pulverized oxen hooves, egg shells, pumice, myrrh, and water creating one of the earliest forms of toothpaste. The Greeks and Romans began adding crushed bones and bark to the mix. The idea, presumably, was to make it more abrasive. No minty fresh breath in those days! The taste, most likely, was hard to take. During this same time the people of China and India were using a similar paste, but adding flavorings, like Ginseng and herbal mints making it a bit more palatable. Modern toothpastes began in the 1800s. The earliest toothpastes weren’t much like what we know today: most were powders, and some had soap and chalk in them. A description of toothpaste from the 1860s mentions charcoal. Toothpaste first appeared in a tube in the 1980s. By 1914, fluoride was added. These pastes were much like what we know today. This ends our brief history of toothpaste. At Blaisdell Family Dentistry in Boise, we want to help our patients have excellent dental health and bright smiles. We provide general and family dentistry, professional teeth whitening and other cosmetic dentistry, and sedation dentistry. Schedule an appointment with us today.